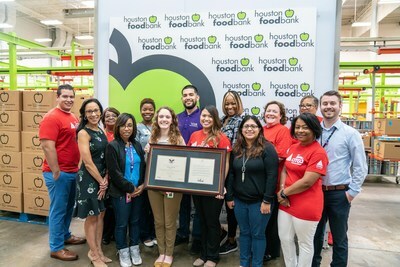 HOUSTON, Aug. 8, 2018 /PRNewswire/ -- CITGO Petroleum Corporation is proud to announce that its employee-driven volunteer group, TeamCITGO, was awarded the Bronze President's Volunteer Service Award (PVSA) by the Houston Food Bank. This award recognizes the Houston-based team's cumulative volunteer time at the Food Bank in 2017 and caps an impressive volunteering effort in 2017, including more than 3,000 community service hours across 67 volunteer opportunities for 44 unique organizations and school districts. "To be honored for our service initiatives in any capacity is meaningful, but to be recognized on the national level truly distinguishes TeamCITGO," said Rafael Gómez, Vice President of Strategic Shareholder Relations, Government & Public Affairs at CITGO. "Volunteerism is one of the core principles of CITGO. Every day, our volunteers across the nation carry out the company's commitment to bettering the communities in which we work and live. This award is a reminder of the impact we can make, and the work we have yet to accomplish." Launched in 2003 by the President of the United States' Council on Service and Civic Participation, the PVSA is the nation's most respected volunteer awards program. This award champions individuals and organizations that have positively impacted their respective communities by dedicating significant time and resources to community service. As an award Certified Leadership Organization, the Houston Food Bank used its position to recognize TeamCITGO as one of its most dedicated volunteer groups, donating enough time - more than 200 hours - to qualify for the Bronze level award. TeamCITGO was founded more than 30 years ago with the purpose of making a difference throughout the CITGO operational footprint. Through volunteerism, TeamCITGO carries out the mission of CITGO by improving the quality of life in each local community served. Other notable initiatives from the Houston-based TeamCITGO in 2017 include 13 STEM events, five Caring for our Coast Events, and assistance with individuals impacted by Hurricane Harvey. CITGO, based in Houston, is a refiner, transporter and marketer of transportation fuels, lubricants, petrochemicals and other industrial products. The company is owned by CITGO Holding, Inc., an indirect wholly owned subsidiary of Petróleos de Venezuela, S.A., the national oil company of the Bolivarian Republic of Venezuela. For more information, visit http://www.CITGO.com.